New York, NY – January, 2014 – International architecture firm Kohn Pedersen Fox Associates (KPF) is pleased to announce that the King’s Court and Carriage Hall scheme for Capital & Counties Properties PLC (Capco) has achieved planning consent from Westminster City Council. 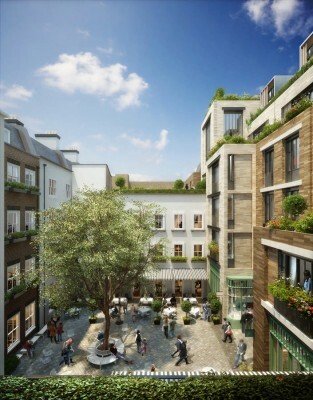 The proposed development, in the heart of the Covent Garden district, includes a new pedestrian passageway connecting Long Acre and King Street, a new public courtyard, and new retail, restaurant and residential space. As well, the Grade II listed Carriage Hall building on the western end of Floral Street will be converted into a new flagship retail space with a covered courtyard. 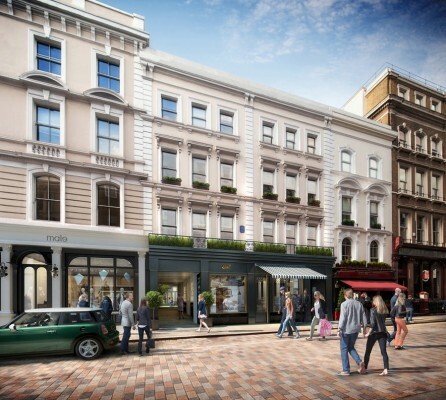 The King’s Court and Carriage Hall scheme will be the largest new construction project in the area since the Royal Opera House in the 1990’s. 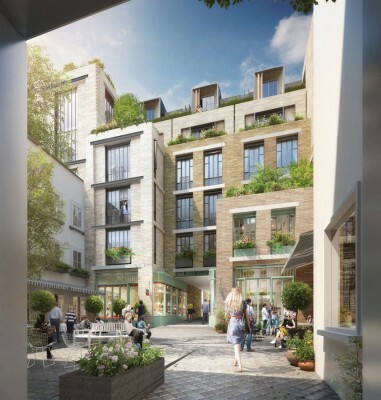 Development across the area will be unified by improvements to the public realm, such as upgraded infrastructure and added public walks and courtyards, which will support and enrich Covent Garden as a whole. The enhancements to the public realm are intended to reflect a gravitational pull to the west, building on recent improvements to King Street. For KPF, which has called Covent Garden its London base for more than 20 years, the project is close to home and core to its mission of improving urban environments through architecture. In addition to its experience in the UK capital, KPF also took cues from its work around the world such as Roppongi Hills in Tokyo and The Landmark in Hong Kong. While King’s Court is at a much smaller scale, it’s also a lifestyle-driven project that provides a vibrant mix of experiences for residents and visitors alike. To design one of London’s most exciting mixed-use spots, a collage of architectural elements is carefully considered and finely tuned. 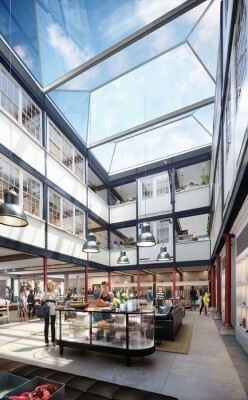 KPF has approached the project with great care and surgical precision, with plans to restore a collection of listed buildings and interiors, sensitively inserting modern elements amidst the historic fabric, and opening passageways and courtyards to provide a dynamic series of public spaces, both inside and out. Discretely placed within existing blocks, much of the design will remain hidden from view. 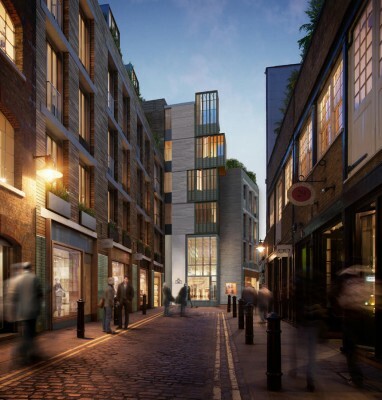 The exception will be a vertical glazed feature on Floral Street, a landmark conceived as a companion to the Royal Ballet Bridge at the opposite end of the street. The design of the new residential building will be a modern interpretation of the typical loft and warehouse typology characteristic of this part of Covent Garden. The new public space will be surrounded by eight retail units and two restaurants with al fresco dining. Retail frontages on Floral Street will animate the western part of the street. The development will offer 45 high quality apartments (31 of which are new build). The new design also includes an outdoor public courtyard. Formerly an internal, private space that was not easily accessed, the courtyard is positioned to be the heart of the development, and encompasses the rich textural palette and sense of discovery for which Covent Garden and the West End is world renowned. The courtyard will enhance the network of public spaces in the district by improving pedestrian flow an alleviating congestion. The objective of this adaptive reuse is to serve as a sustainable new model for growth and preservation within the Covent Garden Conservation Area, and position the neighbourhood for future growth. Work on the project is scheduled to commence in June 2014 and will take up to three years to complete. Kohn Pedersen Fox Associates (KPF) is one of the world’s pre-eminent architecture firms, providing architecture, interior, programming and masterplanning services for clients in both the public and private sectors. Operating as one firm with six global offices, KPF is led by 24 Principals and 27 Directors. The firm’s 600+ staff members come from 43 different countries, speak more than 30 languages and include over 80 LEED accredited professionals. KPF’s diverse portfolio, which features over 70 projects certified or pursuing green building certification, comprises corporate, hospitality, residential, academic, civic, transportation and mixed-use projects located in more than 35 countries.